B'resheet/Genesis 32:32 And the sun rose for him as he passed Penuel; he was limping on his hip. Ya'akov has just had his all-night wrestling match with the mysterious figure - some say Esav's angel, Ya'akov's angel or conscience, others suggest (although the words are not used) the Angel of the L-rd, so perhaps a pre-incarnation appearance of Yeshua - has been given limp and had his name changed from Ya'akov to Isra'el. He had stayed on the further side of the Jabbok river for the night and is now walking, or should that be 'limping', to join his family and put his carefully laid plans for meeting his brother Esav into practice. 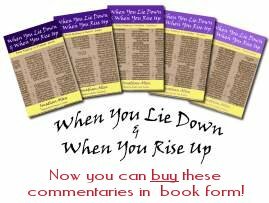 The phrase "the sun rose for him" attracts the attention of the Jewish commentators, both ancient and more recent. The commentators connect our text with its matching verse in the story of Ya'akov's departure from the Land twenty years before: "He came upon a certain place and stopped there for the night, for the sun had set" (B'resheet 28:11, JPS). The comments start with a story attributed to Rabbi Akiva, so pitched around 100-135 CE, only a couple of generations after Yeshua's time. Rabbi Akiva reports (b. Chullin 91b) asking some colleagues in the meat-market at Emmaus whether the sun in our text rose only for Ya'akov or for the whole world. Rabbi Isaac explained that the sun that had set for his sake now rose for his sake because Ya'akov went out from Beer-Sheva to go to Haran, but stopped to pray where his fathers had prayed at Mount Moriah. After praying he wanted to continue his journey, but "the Holy One, blessed be He, said: 'This righteous man has come to my habitation; shall he depart without a night's rest?' Thereupon the sun set" so that he should spend the night there. The Midrash adds that "G-d caused the sun to set prematurely so that He might speak to our father Ya'akov" and restored the two lost hours to him on the morning of our text twenty years later on his return to the Land (B'resheet Rabbah 68:10). Sforno extends that as a promise to the people of Israel, to those who fear G-d: "After he passed Penuel limping, the sun rose and its rays healed him, as it will come to pass in the future as it says, 'But to you who fear My name, the sun ...' (v. 20)". Hirsch uses the image of the sun setting and rising again to make a spiritual observation about Ya'akov's time away: "The whole time that he had been out of the Land had been a period of dark conditions; now at his return, the sun rose again for him: he was not beaten, not broken, but limping." Out of or away from his place, Ya'akov was in some measure of darkness and exile. As he returned to the Land, the light could once again shine into his life and circumstances. He still had to face Esav, but now he was home. David knew this situation well; he wrote many of the psalms during his time of exile from his place - as G-d's anointed leader - being hunted by King Saul and his armies. Despite being harried from pillar to post, at one point having to feign madness to find shelter in the enemy's territory, he penned these famous words: "Even though I walk through the valley of the shadow of death, I will fear no evil, for You are with me; Your rod and Your staff, they comfort me" (Psalm 23:4, ESV). In his later years, when he had to leave Jerusalem and the royal palace to flee from his own son, Absolom, he still records, "O L-RD, how many are my foes! Many are rising against me; many are saying of my soul, there is no salvation for him in God. Selah. But You, O L-RD, are a shield about me, my glory, and the lifter of my head. I cried aloud to the L-RD, and He answered me from His holy hill. Selah. I lay down and slept; I woke again, for the L-RD sustained me. I will not be afraid of many thousands of people who have set themselves against me all around" (Psalm 3:1-6, ESV). This confidence in G-d's presence and support was so strong that the Psalmist can confirm: "Out of my distress I called on the L-RD; the L-RD answered me and set me free. The L-RD is on my side; I will not fear. What can man do to me?" (Psalm 118:5-6, ESV). We all make spiritual journeys throughout our lives; times when we are walking with G-d and times when, frankly, we are walking away from or without G-d. Sometimes, though our journey and destination are at G-d's calling or instruction, we still feel that we are on our own and have been abandoned by friends, family and even G-d Himself. How will we respond to the pressures of life, the attacks by enemy of our souls and even our own self-doubts? Can we have faith enough to rise above the storm and keep hold of G-d's hand? Can we echo these words? "Though I walk in the midst of trouble, You preserve my life; You stretch out Your hand against the wrath of my enemies, and Your right hand delivers me. The L-RD will fulfill His purpose for me; Your steadfast love, O L-RD, endures forever. Do not forsake the work of Your hands" (Psalm 138:7-8, ESV). G-d spoke to the people of Israel through the prophet, to tell them that no matter what trials they had to endure, He would be there with them as He was with David: "Fear not, for I have redeemed you; I have called you by name, you are mine. When you pass through the waters, I will be with you; and through the rivers, they shall not overwhelm you; when you walk through fire you shall not be burned, and the flame shall not consume you. For I am the L-RD your G-d, the Holy One of Israel, your Savior" (Isaiah 43:1b-3a, ESV). These very comforting and encouraging words are intended for the people of Israel, ancient and modern, as the words that bracket them make patently clear - "But now thus says the L-RD, He who created you, O Jacob, He who formed you, O Israel" (v. 1a, ESV) and "I gave Egypt as your ransom, Cush and Seba in exchange for you" (v. 3b) - they cannot be appropriated by non-Jewish believers without specific warrant from the Holy Spirit. Rashi comments to our text, "It is the way people speak: 'When we arrived at a certain place, the dawn began to become light for us'". We have arrived at our place, trusting in Yeshua, being born again and entering into the kingdom of G-d in Him. We are secure in Him: "For no matter how many promises G-d has made, they are 'Yes' in Christ. And so through Him the 'Amen' is spoken by us to the glory of G-d" (2 Corinthians 1:20, NIV). Ya'akov passed by Penuel, the place where he had come face-to-face with G-d and struggled all night to come to terms with himself in G-d's presence, and the sun of healing and warmth rose on him as he went on to be reconciled with Esav and re-enter the Land promised to him and his descendants. As believers, we too have passed by the cross where we came face-to-face with G-d in Messiah Yeshua, and the Son of healing and life has risen upon us. Now we must make sure that we enter the inheritance promised to all those who follow Him: "Let us therefore strive to enter that rest, so that no one may fall" (Hebrews 4:11, ESV). Application: Do you feeling as if you are walking in darkness or shadow? Then today is the day to turn your face towards G-d in Messiah Yeshua and to allow His Son to shine in your life.